The New York City Fire Code (3 RCNY Section 115-02) requires the periodic inspection and servicing of portable fire extinguishers and commercial cooking exhaust systems. A rash of unscrupulous companies providing bogus services had led to fires and significant injuries and loss of property. These senseless and preventable fires triggered a change in the New York City Fire Code, which now authorizes only approved companies to provide the sale and service of portable fire extinguishers and the cleaning and servicing of commercial cooking exhaust systems. To prevent fraud, and as an added measure of proof of compliance, the approved companies will use specifically numbered tags and decals issued by the Fire Department of New York (FDNY). 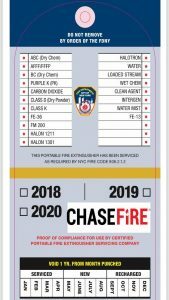 Only companies (like Chase Fire) that meet New York City licensing standards are eligible to purchase FDNY-issued decals and tags, and only FDNY-issued decals and tags will be acceptable proof of inspection, cleaning and/or servicing. Decals and tags that meet FDNY standards are designed with various security measures to prevent counterfeiting. 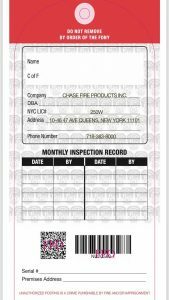 is FDNY Certified for Selling, Servicing and Inspecting Fire Extinguishers in and around New York City. The New York City Fire Department (FDNY) have added a new rule regulating the decals and tags that serve as proof of compliance with New York City Fire Code requirements for fire extinguishers and cooking exhaust systems. Chase Fire and it’s technicians have obtained full Portable Fire Extinguisher certifications and are fully insured.